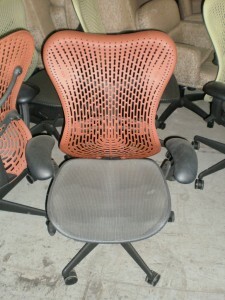 Looking for some full-function chairs for your office? 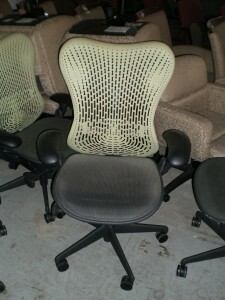 We have these excellent condition pre-owned Herman Miller Mirra chairs available in a number of different back colors, from lime green, to black, to blue, to terracotta. They provide your office with a touch of color that subtly enhances the aesthetics of your office. The net cover allows your back to breathe a bit easier, which helps you to maintain an even, comfortable body temperature. No Comments on "Used Mirra Chairs"